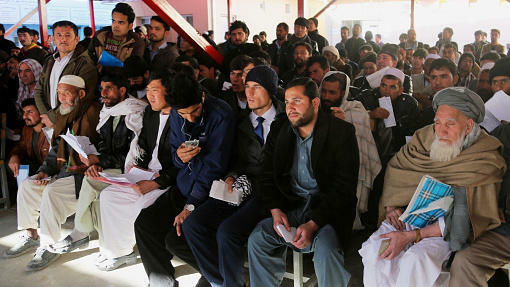 Afghans seeking passports wait in line in Kabul on Jan. 20. Many Afghans are seeking to leave the country, though some have returned from countries like Germany after finding out that they were unlikely to receive asylum. Most of the people applying for asylum in Europe last year were from Syria. The second-largest group was people from Afghanistan. The bulk of these Afghans are in Germany. Now, as NPR's Philip Reeves reports from Kabul, the Germans are trying to stop Afghans from entering. PHILIP REEVES, BYLINE: Abdul Arian was in Germany for months before he realized he had made a mistake. He went there from Afghanistan hoping to study psychology. The journey was rough. Arian says he nearly drowned when the inflatable dinghy he was in capsized. Yet the reason Arian finally saw his mistake wasn't because something horrible happened to him. It was because nothing happened at all. ABDUL ARIAN: (Through interpreter) We had nothing to do. REEVES: When Arian arrived in Germany, he was placed in a migrants reception center in a village. There, he just hung about. He played a lot of soccer. He ate a lot of jelly sandwiches. He says no one wanted to listen to him explain why he should be granted asylum. ARIAN: (Through interpreter) When we arrived, they just took our names. I was in Germany for nearly 10 months, but no one asked me why I was there. REEVES: Arian, who's 24, says Syrians at his reception center were given language lessons and eventually passports. ARIAN: (Through interpreter) When we complained to the social workers, they responded frankly. They said, we've invited Syrians here, not Afghans. REEVES: As the weeks dragged on, Arian concluded he had no chance of being allowed to stay in Germany. He became depressed. ARIAN: (Through interpreter) I was very bad condition. I couldn't sleep. I decided to go back to Afghanistan before I went crazy. REEVES: Arian returned home last month. He was one of 125 Afghans voluntarily flown back to Afghanistan on a charter flight organized by the German and Afghan governments. Arian's family spent most of their savings on his trip to Germany. To pay the people smugglers, they sold land and a car. Arian's worrying about what his family now feels about this. ARIAN: (Through interpreter) So far, I haven't seen any reaction from them because I've just arrived back, but I don't know what's in their hearts. REEVES: Coming home having failed can be very tough and also humiliating, says Shirbil Bayat. SHIRBIL BAYAT: (Through interpreter) Some people jeer at you. They ask, why did so and so get citizenship in Europe while you didn't? Maybe you're useless. REEVES: Bayat was deported from Denmark two years ago, after a court rejected his asylum application. He says it took him 16 months to find a permanent job in Afghanistan as an office cleaner. On the day he spoke to NPR recently, he was laid off because of budget cuts. He has no idea of what to do next. Last year, 150,000 Afghans arrived in Germany. The German authorities estimate less than half will qualify for asylum. Officials say, at present, a tiny number of Afghans are willing to go back voluntarily. Others will have to leave, says Germany's ambassador to Afghanistan, Markus Potzel. MARKUS POTZEL: It means that more than half of them have to be sent back because they can't stay. But there's, of course - there are some obstacles to send them back immediately, but we have a huge number of Afghans who are not eligible to stay in Germany and should be sent back. REEVES: The Germans are running a PR campaign in Afghanistan, trying to deter Afghans from traveling to their land. They've posted announcements on billboards, buses and the Internet, urging Afghans to think twice. Germany views many Afghans who've arrived on its soil as economic migrants who are seeking jobs or education. Its officials say, under international law, Germany's not required to grant asylum to those migrants, unlike Syrians, who are fleeing war. Last year, an estimated 11,000 civilians were killed or injured by conflict in Afghanistan. Afghans say that's proof there's war in Afghanistan, too. Potzel, Germany's ambassador, says the situation's very different to Syria's. POTZEL: Here in Afghanistan, you don't have a government who would bomb their whole population - their own population. Here, the government tries to protect their own people. There are unsafe regions, and there are less unsafe regions in Afghanistan. And there are regions, especially in the big cities, where sort of normal life is going on. ASHRAF HAIDARI: Afghans are not leaving Afghanistan because of, you know, a lack of jobs. REEVES: Ashraf Haidari is head of policy and strategy at Afghanistan's foreign ministry. HAIDARI: They're fleeing generalized violence, terrorism on a daily basis that is killing our people - you know, men, women, children. That and also political uncertainty as a result of the withdrawal of, you know, international forces and diminishing international civilian development aid. REEVES: Haidari argues that European nations should take in Afghans. It looks like many more are on their way. Hundreds of men line up outside a government office in the early morning in the Afghan capital of Kabul. They're here to apply for passports. Wahidullah Mohammadi, who's 19, wants to migrate to Europe to go to school. He's undeterred by the dangerous journey. WAHIDULLAH MOHAMMADI: (Through interpreter) I've have heard about the risks on the way, but I accept the risk. REEVES: Mohammadi is aware of the risk of being deported back home. He's willing to take that chance. MOHAMMADI: (Through interpreter) The situation is not good here, and there is no guaranteed future, and we have to accept these risks. REEVES: Philip Reeves, NPR News, Kabul. Transcript provided by NPR, Copyright NPR.